Several things have made me curious with The Sims 2. Namely, where does the Road To Nowhere in Strangetown lead to? What lies over the bridge in Pleasantview? Where does the canal go to in Veronaville? I can't answer those questions in those hoods, but I can answer the questions in my own hoods. Using Sim City 4, I created a region in which all of the hood terrains I play exist- a region where, yes- I know where that road leads. It has evolved over several years, as opposed to being something I created all at once. I first made a small island which I liked in a different region, and I played that so much that I imported it into another region, to improve the setting. 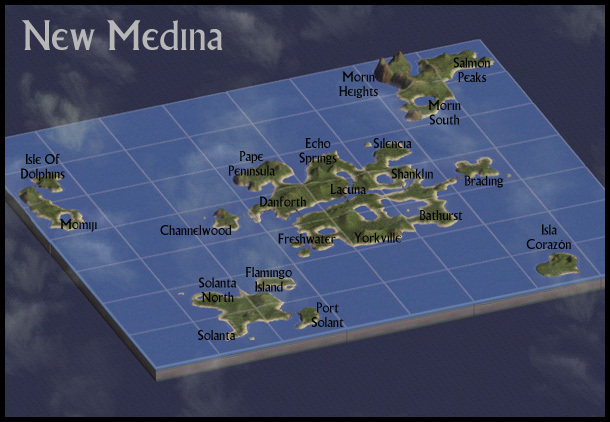 Anyway, what I ended up with is New Medina- which is a group of islands in a nice blue sea. Many of the land masses are connected by bridges; the more distant parts are accessible only by boat or plane. You'll have to use your imagination for that bit! Due to the size of the files, I've split it into two parts- Main Hoods and Vacation Hoods, based on what I think each terrain is most suited to. This part contains the Main Hoods. Of course, you can use each terrain for whatever you like- main hood, business hood, University, Downtown or Vacation hood. And you need only the basegame- you can play any of these in any game. Because I really dislike the way that The Sims 2 deals with the 'forestation' of SC4 terrains, I've made these completely bare- no trees at all. This is because- especially if you have the later EPs- it is much easier to download a neighbourhood camera mod and add your own trees than it is to try to delete thousands of inappropriately placed mountain conifers from your island resort. I recommend this camera mod to do that with. 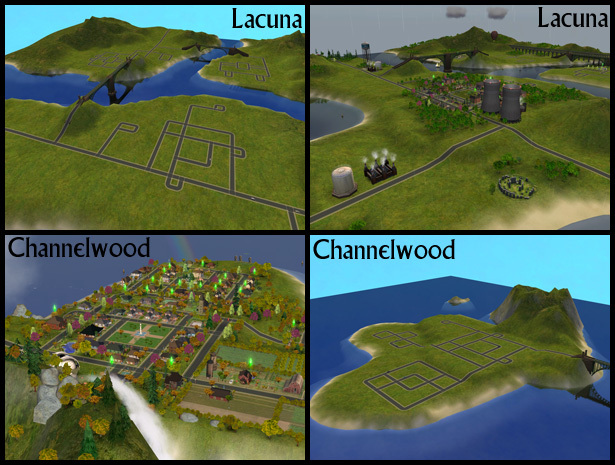 Main Hoods: Lacuna, Brading and Channelwood. Lacuna lies where two rivers meet. It has two bridges, and three seperate areas to build. I like to place an aqueduct across one river. Brading is an island with the main roads arcing around a bay. You could place beach lots there, or perhaps build a marina. Channelwood is my favourite terrain; I played this island for many generations. It is a volcanic island with a large cratered mountain. My Channelwood pictures are here. Business Hoods: Shanklin, Freshwater, Pape Peninsula and Echo Springs. Shanklin has a bridge and a place to put a waterfall. Nice and flat for your larger lots. Freshwater has a place for beach lots, as well as two Islands attached by bridges. Home for your entrepreneurs? Pape Peninsula is nice and flat with a symmetrical road layout. Echo Springs is surrounded by ocean; again a flat road area suitable for larger lots. 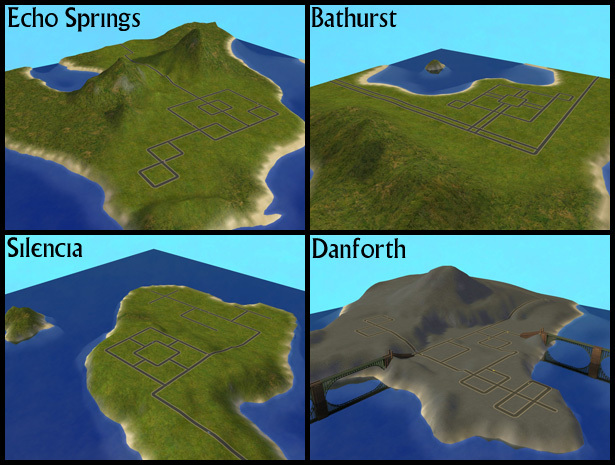 Bathurst has a flat road area with a large square in the centre; an ideal place for the University tower or monument. Students could dare each other to swim out to the small island! Silencia is a quiet peninsula conducive to study. There is an area for housing and an upper area for the University buildings. Yorkville has a large grid of roads next to the main freeway. I like to put a monorail in between the two freeway roads. It is next to a lake which gives a nice reflection to your skyscrapers. Danforth has two bridges, and is for a smaller city. Your downtownies will like the views! You can see how the terrains fit together if you look at the region image. You could use these individually, or in combinations. I am currently playing Lacuna, with Bathurst as the Uni, Yorkville as my Downtown and Shanklin as my shopping hood. I have all as lush terrains except for Yorkville, which looks good in concrete. 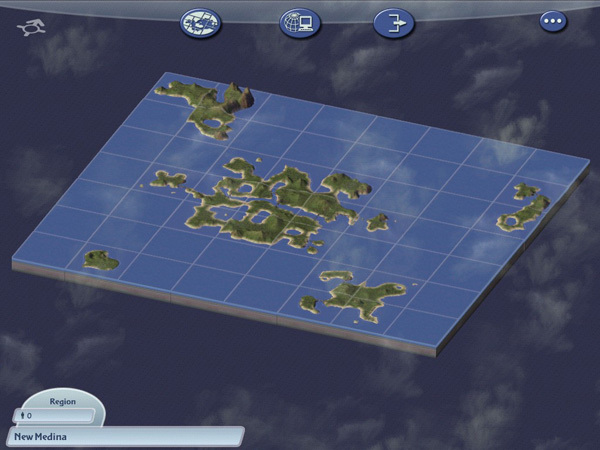 Just download the terrains you like and extract the files to Documents\ EA Games\ The Sims 2\SC4 Terrains. They will show up in game when you choose to add a neighbourhood or subhood. Get part 2: Vacation Hood Terrains to complete the region. 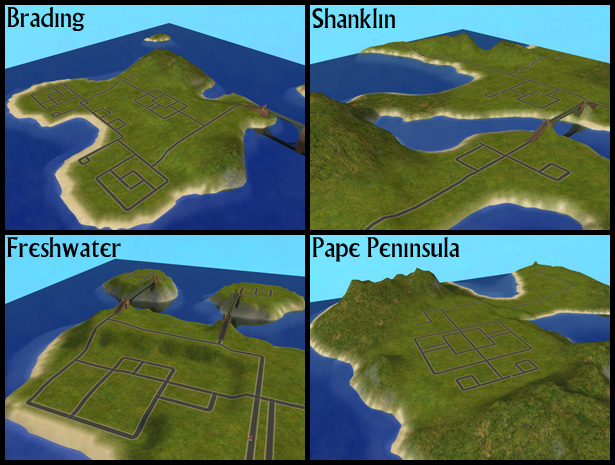 If you have Sim City 4 and would like to download the whole terrain, click here to download. Just extract to Documents/ Sim City 4/ Regions. Thankyou to Delphy and all who frequent MTS2 for making it such a great place to learn! 472 people have said thanks to simsample for this download.